First, if you don’t know what OpenSocial is read this: Explaining OpenSocial to your Executives. Forrester will be publishing a report on OpenSocial in the near future (I interviewed David and Kevin Marks last night), I’m on point for that, stay tuned. 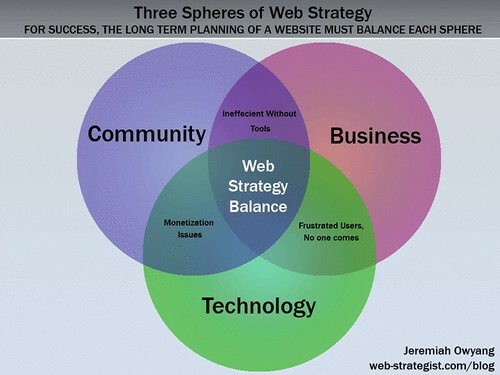 You, a web decision maker are probally considering creating widgets to reach distributed communities. The opportunity to build an application once and let it run everywhere is still underway. I recommend you continue to watch this space, put a key developer or agnecy on point to start creating your applications in compliance, but plan on customizing your apps per the unique demographic for each social network. 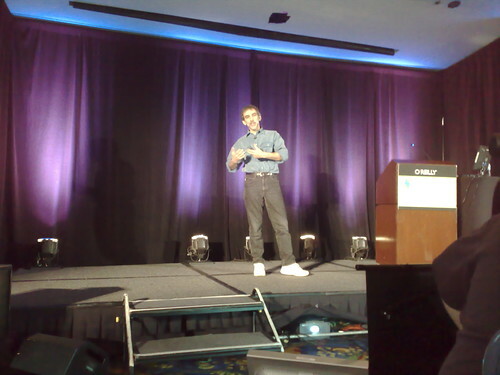 David of Glazer of Google’s OpenSocial team shares at Graphing Social. He suggests that novice should read Nicholas Carr’s book “the Big Switch” on social computing, there are parallels between open grid electricity and open web. It’s fast, easy, open, and everywhere. Move the accidental objects out of the way so we can interact better. People care about other people, not a new idea but the social context, people are the killer app. -Fragmented identity: how many times do we need to add friends? -Fragmented app development: how many times do we have to build an app? 1) Invent it: Come up with a great idea (app) that you want to do with your friends. -Communities (like white Label): Like corporate communities, nings, etc. A great idea but you’ve got to work at it. Need to get the following right: Clear mission, Open License, Engaged Community, Real-world use. Recently at our home, we purchased a new laptop, which came with Vista on it. Sadly, it didn’t come with Microsoft Office on it, and I was not able to open any word docs, excel, or powerpoints. I asked the store how much it would cost to add office, and they suggested in was $175. This seemed like a lot of money for a software system that I’m used to seeing as a base line image on most computers. As a result (and being web savvy, of sorts) I started to use Google Docs, an online, ‘free’ version of office. Google offers an online spreadsheet tool, as well as an online document word processing tool, all with collaborative features that I could share with others. As I continued to use these Google docs, I started to infect others, evangelism runs within my veins, and soon my wife started to use it, and I used it for a variety of documents within my new employer. I’m not sure if it’s becuase of me, but other colleagues in my team are using Google Docs for team collaboration. It’s not just Google either, Zoho is coming around the bend quickly, and had quite a presence at the recent Office 2.0 conference in SF that attendees were wondering why Microsoft was not present. I wonder if Microsoft is missing a major opportunity here by: 1) Not providing these basic tools on the OS that buyers are not willing to purchase and 2) Not being agile to see how information is moving to the cloud and thus offering tools for the online office. When I do a google search for Microsoft online office, it results in thanksgiving colored templates. Talking to Rafe of Webware (they believe in the web as a platform) he mentioned to me that the internet has made boxed software irrelevant, as users can now download them from the web, or use web versions of products. What other software companies are missing an opportunity because of the web? A few weeks ago, Facebook thought leaders Dave and Justin identified and shaped the term News Feed Optimization. Sadly, (or gladly) we suspect it has already jumped the shark. What’s News Feed Optimization (NFO)? It’s an evolution of social media optimization where a clever developer will maninupate a Facebook application so it appears more frequently on the Facebook News Page (essentially a Feedreader). The opportunity? viral growth from massive network awareness. Facebook is a savvy company, already aware of the massive opportunities that applications can grow and amazing rates. Aware of the tricks of clever application developers, they’re preserving the user experience by limiting the power applications have to ‘spam’ out over news feeds. Also, Facebook is continuing to optimize and recently articles suggest they ‘punish’ spammy applications, so some notifications have been decreased to protect users. It’s important to note that when a user installs an application, it’s default behavior updates their entire network. Still don’t believe me? Want to start a career as a NFO? well then www.newfeedoptimization.com is for sale, would make an excellent buy. Hungry for more social networking industry news? I’ve got the thing just for you, I publish a weekly digest of the social networking industry for those who don’t have time to scour the web like a mad web strategist. I don’t need a TV truck, radio station, or printing press to reach thousands of people, and neither do you. In my current role at PodTech, much of my job was to be out in the field where the people are, and use social media to demonstrate how PodTech could deliver to clients. The tactic? I was a walking media platform, and at any time, anywhere, I could publish text, video, audio, or pictures to thousands of people within minutes. I could break news, live stream events, live blog, twitter from my mobile phone, send emails to the influentials, kick start conversations or most importantly, just listen to the network. Over my time at PodTech, I uploaded close to 8,000 pictures, hundreds of videos, over 1,000 blog posts, and did at least 2 weeks of live streaming. I surprised folks by my rapid ability to post session notes, pictures and even video within 30 minutes of a conference. I want to record how life has been over the last year as things change. See all my posts tagged event or conference to learn see the output (please note most was in real-time or within 12 hours of an event). 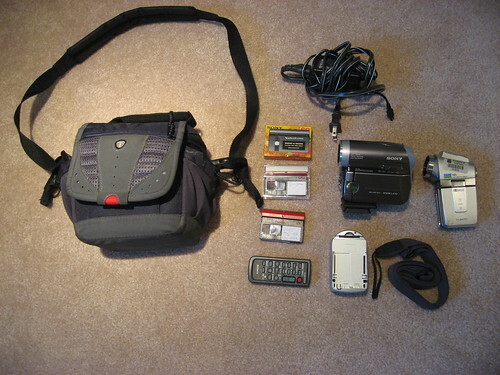 In the spirit of the popular “whats in your bag” flickr meme, here’s my response. Backpack: I just love this rugged and stylish backpack, it should be able to hold up to my abuse, with lots of utility. I have this phone on me, although outdated, it gives me access to the web, text messaging, with a powerful speakerphone. Why don’t I use a smartphone? Because I’m often in front of a computer. 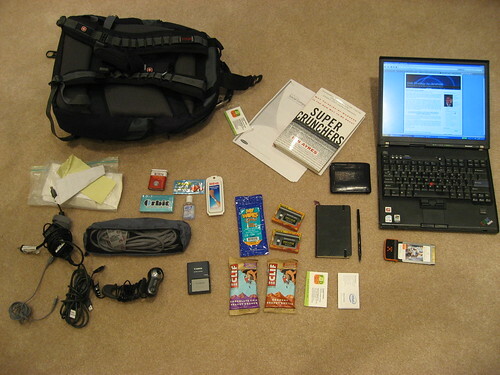 Alight, I’m tagging bloggers Robert Scoble, Mario Sundar, Chris Pirillo, Scott Squid, and Thomas Hawk to open up and show me what’s in their bags, give an inventory list, your strategy. Now that the confetti is being swept neatly to the gutters after last week’s parade, the real residents of the technology main street are starting to appear with concerns about the Apple iPhone. Apple is taking heat, flack for being not willing to be an open platform like so many third party applications. The exclusive lock down (both in platform and with employees) is denoted by Brian. The real cost of the Apple iPhone is being speculated by Allen at quite a bit more than any amount you anticipated, do you want to spend up to 2k a year on a phone? Lastly, Uncle Dave Winer doesn’t want to be confined, both by the information we receive or the technology, so why should we? Steve Jobs is an excellent Marketer, the products requirements come from extensive Marketing Research, (product design comes after, BTW) and the advertising has been unique and innovative for decades. Yesterday, I challenged that the iPhone is being over hyped.